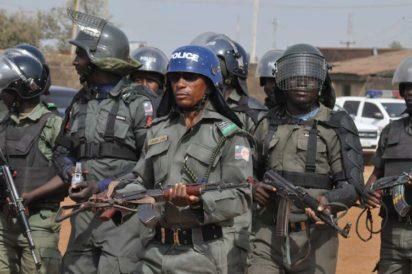 Dutse – Mr Bala Zama, the Police Commissioner in Jigawa, has issued a 10-day ultimatum to militias, bandits and vigilance groups to surrender prohibited arms in their possession. Cross Section of Policemen during the flag off of Operation Harmony in Kafanchan , Kaduna State. Photo by Gbemiga Olamikan. Zama gave the ultimatum in a statement he personally signed in Dutse on Wednesday. He said the ultimatum followed a directive to all Commissioners of Police nationwide to commence the disarmament and recovery of all prohibited firearms in possession of militias, bandits and vigilante groups. He said the ultimatum affected “groups of any kind or individuals/bodies bearing prohibited, locally fabricated and modified weapons manufactured for the purpose to cause security breach, or threat to law and order in the country”. “Therefore, members of the public, individuals and groups, under any guise other than statutory security agencies recognised by law of the Federal Republic of Nigeria to bear firearms of specified category, are hereby warned. “They are given up to 15th of March, 2018 to surrender them to the Commissioner of Police. “For avoidance of doubt, the Robbery and Firearms Act cap R11 LFN 2004 and Firearms Act cap F28 LFN 2004 are explicit on punishment for dealing in arms and ammunition,” Zama warned. He added that a committee had been formed to execute the exercise in the state. The commissioner of police further explained that operation of the committee would include cordon and search, raid, seizure from premises and hideouts across the state where it is reasonably suspected that firearms and ammunition are kept. According to him, it will also be carried out in dwelling houses, completed or uncompleted. Zama, therefore, urged all stakeholders to advise their wards, vigilante watch men and all those in possession of prohibited firearms and ammunition to surrender them within the stipulated time. He further warned that those found with firearms after the expiration of the notice would face the wrath of the law. The CP also urged members of the public to report any person they noticed in possession of firearms in the state to the nearest Police Division in their localities. The post Police gives 10-day ultimatum to militias, bandits in Jigawa appeared first on Vanguard News.